Shuffling bare feet on the sands of Waikiki Beach is a great way to become acquainted with the Hawaiian island of Oahu, but there’s much more to see and do than just splash in the ocean. 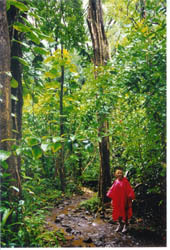 Nearly every day is perfect for hiking on island, and trails for every ability level are abundant. On a misty morning hike to the top of Diamond Head, Oahu’s famous dormant volcano (an adventure in itself), we ran into the director of the Hawaii Rainforest Foundation, a non-profit organization committed to preservation of Hawaii’s fragile environment. His enthusiasm for sharing the beauty of the island convinced us to sign up for one of his guided nature hikes to learn more about Oahu’s botanical delights, as well as geology, history, and mythology of the region. The next morning our group was driven to the rainforest, located in the majestic Ko’olau Mountains above Honolulu. For three hours we trekked through a lush tropical rainforest while listening to our guide’s knowledgeable commentary about every plant, large and small, and exotic fruits like mountain apples and strawberry guavas. We learned that Ti plants, whose leaves, when wrapped around money, are said to bring good fortune. Thick bamboo stands shielded us only slightly from frequent showers—this was the rainforest, after all--as we squished along muddy trails. After about an hour, the sound of rushing water led us to a clearing, where 300-foot waterfalls crashed and splashed into a rocky freshwater pool—a pool that was bone-chilling cold. But I hadn’t hiked two miles to stand on the edge. Quickly I stripped off clothing over my bathing suit and scrambled down large rocks for a toe touch. I slid gingerly off a small boulder--and gasped as the icy water swirled around me. 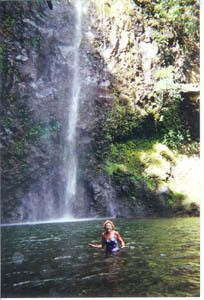 The exhilaration lasted a few breath-taking moments, long enough for my husband Larry to snap photos proving my bravery. Later, after I had climbed out and warmed up, I took a good look around at our surroundings--the beautiful, lush vegetation enveloping a gorgeous waterfall--and realized that we had truly walked in paradise.